Haunted States! : 5 to 8 p.m. Friday at Aina Haina School, 801 W. Hind Drive. Slightly spooky tour through American folklore and urban myths. $2 adults; $1 children. Funds raised support library programs. Call 377-2419 or e-mail ashpta@hawaii.rr.com. Haunted House: Meet ghosts and goblins at Easter Seals sixth annual haunted house. Also, face painting, games, arts and crafts. 6 to 10 p.m. Friday and Saturday at 91-1251 Renton Road in Ewa Beach. $3 admission; children under 3 are free. Manana Haunted House: 6:30 p.m. Friday and Saturday at Manana Community Park. Call Cass at 453-7527. Scare Factory III: Ten-room haunted house, 6 to 10 p.m. Friday, noon to 10 p.m. Saturday and noon to 6 p.m. Sunday, Windward Mall upper level. Admission is $6; children under 4 are free. Coconut Willy's, International Marketplace: 10 p.m. Monday. Call 923-9454. Kahala Mall: 2 to 3 p.m. Saturday. Call 733-7357. Kaimuki Community Park: 6 p.m. Friday. Contest held at the park's bandstand stage. 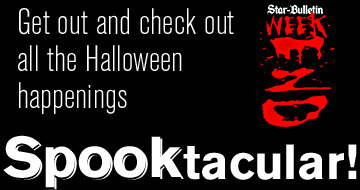 Categories include cutest, spookiest and most creative. Call 733-7350. Market City Shopping Center: Parade and contest, 6:30 p.m. Saturday. Judging for cutest, scariest and most original costumes for children under 12. Call 734-0282. Salt Lake District Park: 6:30 p.m. Friday. Prizes for most adorable, most creative and most "Halloween." Call 483-7852 or 483-7850. Salt Lake Shopping Center: 10 a.m. Saturday. For children under 16. Categories include funniest/scariest, most original and judge's choice. Wahiawa Shopping Center: 12:30 to 1 p.m. Saturday. Part of a Halloween festival. Waimanalo District Park: 2:30 p.m. Saturday. Includes a "treat street." Call 259-8926. 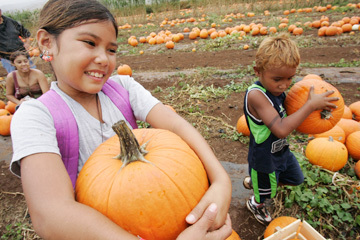 Mariah and Hunter Nery take a break from their harvesting, at the Aloun Farm Pumpkin Patch in Kapolei. The patch is open 9 a.m. to 5 p.m. Saturday and Sunday and also features pony rides, a petting zoo and more. "A Night to Remember": 6 to 10:30 p.m. Sunday at the Ilikai Renaissance Hotel. Featuring emcee Justin Cruz and entertainment by Sharon Cuneta and Martin Nievera, costume contests, live auctions and more. Attire is formal, barong or Halloween costume. Donation of $100, which benefits FAMES program, At-Risk Children and Hurricane Katrina Relief Fund. Call Joni Redick at 781-5905 or Rose Mendoza at 371-3902 for reservations. Family Fun Night Halloween Carnival: 6 to 9 p.m. Monday at Calvary Chapel. Games, crafts, food booths and more. The Donut Man will also perform two mini concerts. Admission is free. Call 524-0844. Hallo-Wine Tasting and Silent Auction: 6 to 9 p.m. Saturday at Mid-Pac Country Club. Blind tasting with wines donated from Kalapawai Market, a costume contest and door prizes. Cost is $40. Proceeds benefit the Windward YWCA Financial Assistance Program. Call Bill Stone at 261-0808 or Mark Cabral at 228-5577. "The Haunted Village": 6 to 8:30 p.m. Friday at Windward Community College. Featuring the Imaginarium show, "Nightwalk," Dr. Phrankenstein's Phantom Physics Lab with hands-on activities and optical demonstrations, a pumpkin carving contest and display, a haunted village, spooky storytelling and more. Call 235-7321. Halloween Bash 2005: Pumpkin painting, hay rides, bobbing for apples, music, petting zoo, haunted graveyard and more, 4 to 9 p.m. Saturday at the Stables at Turtle Bay Resort. Cost is $15; $10 for children. Call 293-6000. Halloween Bonanza: 11:30 a.m. to 3:30 p.m. Sunday at Global Village and various Kailua businesses. Activities include a costume contest, face painting, trick-or-treating, spooky story reading, crafts and more. Call 262-8183 or e-mail info@globalvillagehawaii.com. Keiki Carnival: 5:30 to 9 p.m. Monday at Church of Christ in Kailua. The theme is "Circus Circus" and features free hot dogs, candy, games, prizes and jumpers. Call 262-5227 or e-mail info@churchofchrist.org. Penny Carnival: An alternative Halloween event featuring food, games and prizes, 6:30 to 8:30 p.m. Monday, United Church of Christ, 467 N. Judd St. Call 536-8418. Spooktacular Dance: 7 to 11 p.m. Saturday at Fleet Reserve. Sponsored by Parents Without Partners. Costume contest, heavy pupus and more. Cost is $20; $15 for PWP members. Call Phillis at 262-7441 (days only) or Sharron at 258-9504. Treat Street: Trick-or-treating at a neighborhood created by University of Hawaii's School of Architecture, 5:30 p.m. Monday, Bishop Museum; 847-3511. Also, creepy crawly cockroach race, costume contests, games, food and more. Visit www.bishopmuseum.org. "Trick or Trees: Sustaining the Enchanted Forest": The Outdoor Circle hosts its annual fund-raiser with silent auction, costumes, dinner and entertainment, 5:30 p.m. Saturday, Hilton Hawaiian Village. All proceeds benefit the organization's "Moving Billboards Out of Hawaii" campaign. Cost is $150. Call 593-0300. Trick R Treat: Halloween alternative event, 6 to 8 p.m. Monday. Candy will be distributed from trunks of cars at Cornerstone Fellowship, 95-1080 Ukuwai St., Mililani. Also, games, refreshments, bouncer and dunking booth. Call Joyce at 625-3651. Waikiki Sunset on the Beach Halloween Activities: Tribute to late filmmaker Kayo Hatta (originally scheduled last week but cancelled due to rain) on Saturday. It is preceded by a costume contest at 4:30 p.m. "Ghostbusters" will be shown on Sunday, with a pumpkin-carving contest at 4:30 p.m. Movie screenings start around 6:30 p.m. Call 923-1094 for more information. Waimanalo Community Treat Street: 1:30 to 5:30 p.m. Saturday, Waimanalo Beach Park. Activities include family pumpkin-carving contest at 1:30 p.m., costume contest at 2:30 p.m. and Treat Street at 4 p.m. Free, including refreshments. Call 259-8926. Noah Chung learned that pumpkin picking takes muscle and sweat. All events on Monday unless otherwise indicated. Ala Moana Center: 5 to 8 p.m. at participating merchants; 946-2811. Kahala Mall: 6 to 8 p.m.; 732-7736. Look for balloons and jack-o'-lanterns at participating stores. Koko Marina Center: 4:30 to 6:30 p.m. Visit merchants with balloons and "trick or treat here" signs. Market City Shopping Center: 6:30 p.m. Saturday at participating merchants; 734-0282. Mililani Shopping Center: 3 to 5 p.m. Saturday. Featuring a performance with Mr. Amazing the Magician at 3 p.m., Halloween crafts and activities and a trick-or-treat costume parade through the center. Call 234-0404. Pearlridge: 5 to 7 p.m. at participating merchants; 488-0981. Also, face painting, Clarke Tuitele Hypnosis show (7 p.m.). Salt Lake Shopping Center: 10 a.m. to 1 p.m. Saturday at participating merchants; 735-8822. For children under 13. Must be accompanied by an adult. Take photographs in the "fall pumpkin patch." Victoria Ward Centers: 6 to 8 p.m.; look for black cat signs at participating merchants. Treats distributed at Ward Entertainment Center, Ward Warehouse, Ward Village Shops and Ward Farmers Market. Free photos at Ward Centre. Wahiawa Shopping Center: 11 a.m. to 2 p.m. Saturday. Free magic show and balloon animals (11 a.m. to noon), keiki bounce house, carousel rides. Windward Mall: 5 to 7 p.m.; 235-1143. Architect Hawaii's Annual Pumpkin-Carving Competition: Elaborately carved pumpkins will be displayed Monday at the American Savings Bank tower lobby from 8 a.m. to 4 p.m. Voting will be open until noon. Winners announced at 1 p.m.
Candy Drive: Serendipity Books 'n Gifts Trick or Treat Drive for children at IHS. Donations accepted until Saturday. Serendipity will match the donation and provide ghost and goblin bags. Candy, nuts, gum or crack seed in original wrappers; stickers, crayons and coloring books accepted. Call 949-4711. "Cats in Costume": Contest, noon to 1 p.m. Saturday, McCoy Pavilion, Ala Moana Beach Park. Costumes judged on originality and comfort of fit. Prizes also awarded for best decorated cage. Call 261-4354. Halloween Cruise to Lahaina: Avoid traffic and parking for Halloween festivities. Cruise departs at 7 p.m. Monday with check-in at the Pacific Whale Foundation and arrival in Lahaina at 8 p.m. Returns to Maalaea at 11 p.m., with a 10 p.m. departure. Cost is $55; children under 12 are half price which includes pupus. Call 249-8811 or (800) 942-5311. "Howl-oween Fun": Enjoy K-9 Game Day from 9 a.m. to 2 p.m. Saturday at Thomas Square. Pet costume contest, pumpkin decorating, and early holiday photos with "Santa Paws" (for a $20 donation to the Humane Society). A Pooch Parlor featuring massage, grooming and nail painting also will be featured. Maunawili Fun Fair: Features entertainment, keiki games, a book fair and silent auction that includes such items for bid as rounds of golf, restaurant gift certificates and jewelry. 10 a.m. to 3 p.m. Saturday at Maunawili Elementary School. Printing Discounts: Best Printing is offering a 10 percent discount to any customer dressed in a costume at their four locations: Ala Moana Center, Bishop Square, Topa Tower and Pioneer Plaza. Visit www.bestprinting.net. Pumpkin Carving Gala: 6 to 10 p.m. Monday, School of Architecture, 2410 Campus Road, The School of Architecture transforms vegetables into works of art at the annual carving event. The competition is judged on craftsmanship, use of medium, lighting and creativity. All of the carved pumpkins are donated to local hospitals. Also, costume contest for children and adults, a food eating contest. a book nook and more. E-mail Melanie Wong at aias@hawaii.edu with the subject line "Halloween Gala." 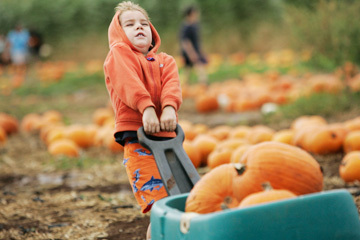 Pumpkin Patch: Pumpkin picking, pony rides, petting zoo and more, 9 a.m. to 5 p.m. Saturday and Sunday, Aloun Farms. Call 677-9516, ext. 41. Scarecrow Display: Made by the Parents and Children Together (PACT) Community Teen Center. On display through Tuesday at Compadres Bar & Grill, Ward Centre. Call 591-8307. Sixth Annual Howl-oween Dog Costume Contest: 11 a.m. to 1 p.m. Sunday, Ward Warehouse Amphitheater. Register after 10 a.m. More than $1,500 worth of prizes and biscuits. Sponsored by Hawaii Doggie Bakery & Gift Shop. Special Effects Make-Up: 11 a.m. to 5 p.m. Saturday and Sunday, Serendipity Books 'n Gifts, with make-up artist and stage entertainer Fred Michaels. Cost is $65. Call 949-4711. Haunted Walking and Bus Tour: Storyteller Lopaka Kapanui takes participants on a seven-hour tour starting at Kawaiahao Cemetery at 6:30 p.m. Friday. Other visited sites include Oahu Cemetery, Ewa Village Plantation, Pokai Bay Heiau and the Mauka Cave in Waianae. The proceeds benefit a Medicorps program in Cambodia. Cost is $55. Call 754-4154. Halloween Spooky Stories: Glenn Oide shares haunting tales, 6 to 7 p.m. Sunday, Serendipity Books 'n Gifts. Free. Call 949-4711. Lopaka Kapanui launches his new book, "Haunted Hawaiian Nights," with a reading and book signing, 6:30 to 8:30 p.m. Thursday, Native Books, Ward Warehouse. Call Christina at 783-2612. "Spooky Tales": Storytellers including Woody Fern share Hawaiian ghost stories and other hair-raising tales, Friday, Keauhou Beach Resort on the Big Island. All events from 6:30 to 8:30 p.m. Free. Call 800-688-7444. Bliss Nightclub: Crucible, Dagra and the Miltons, 9 p.m. to 1 a.m. Thursday at 327 Keawe St. $5 at the door. Call 728-1381 or 295-6663. Campy Horror Night: 6 to 9 p.m. Friday at the Honolulu Academy of Arts. Tarot card readings, palm readings and face painting. 12th Avenue Grill provides treats and drinks for purchase. All galleries will be open. Admission is $7; free for members. Call 532-6091. "Devil's Night": 9:15 p.m. Sunday at Detox Bar & Grill. Celebrate with the Crud, Missing Dave, Pimpbot, MVA and a costume contest. Free admission. "Halloween -- The Dark Knight": 8 p.m. to 4 a.m. Monday, Fusion Waikiki. Costume contests, DJ Regina, Viva Tropicana, more. Black rubber attire recommended. Cost is $8 in advance; $12 at the door. Call 924-2422. "Halloween Gone Wild -- Boogie Nights": Fund-raiser for GIFT Foundation Friday. A secret location will be disclosed to attendees. Proceeds benefit Ohai Productions, a performing-arts program for children. Tickets are $100. Call 535-2131 or visit thegiftfoundationofhawaii.org. Halloween Fiesta: Costume contest, Mexican and salsa music, pinatas; 9 p.m. to 1:30 a.m. Friday, Panama Hattie's, 99-016 Kamehameha Highway. Cover is $8. Call 285-0072. Halloween Salsa Dance: DJ Rod el Moreno and Swing music, 7:30 to 8:30 p.m. Monday. Lessons, 8:30 to 9 p.m. with dancing until midnight. Dream to Dance, 661 Auahi St. $5 cover. Call Debby at 734-0264. "Monster Mash": Salsa Style pre-Halloween party Thursday, Rumours Nightclub. Featuring DJ Rod el Moreno, Ray Cruz, DJ Alberto and DJ Armando. Complimentary appetizers, 5 to 8 p.m., and salsa lessons from 6:30 to 7 p.m. Cover is $7. Call 955-4811 or 285-0072. Pre-Halloween Bash -- Latin Style: Live entertainment with Tommy Valentine Y Sus Amigos, dancing, appetizers, costume contest and more; 7 p.m. to midnight Saturday, United Puerto Rican Association Social Hall, 1249 N. School St. Tickets are $10 advance; $12 at the door. Call 285-0072. Pre-Halloween Spooktacular: Costume contests, treats, salsa lessons, entertainment. At Carnaval-Las Palmas Friday, Saturday and Sunday. Call 285-0072. Tiki's Bar & Grill Festivities: Dining patrons who come dressed as a tiki (Friday through Monday) receive a $30 gift certificate and a souvenir photo. Jack-o'-lanterns also will be on display at the annual pumpkin-carving contest that features entries created by Tiki's ohana. On Monday, live entertainment includes Mel Amina from 5 to 7 p.m.; Shawn Ishimoto from 7 to 9 p.m.; and Ellsworth Simeona from 9 to 11 p.m. Call 923-8454 for reservations.